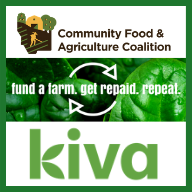 At this free event, five Western Montana farms & food businesses will present live pitches for 0%-interest loans funded through Kiva.org. Each loan will allow the businesses to invest in infrastructure upgrades and expand their operations. Attendees will have opportunities to contribute to the loans at and after the live event, and will be able to sample the businesses' products via a tasting menu prepared by Burns St. Bistro. Hosted by the Community Food and Agriculture Coalition (CFAC).